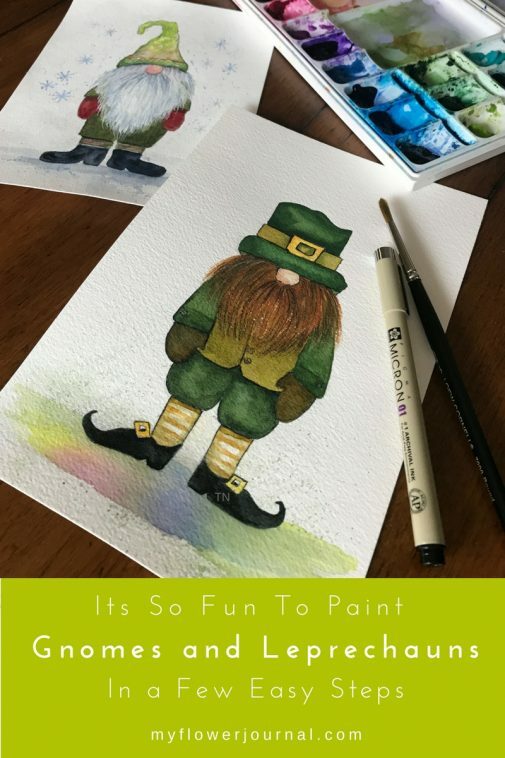 Painting a watercolor leprechaun is as easy as 1,2,3 if you follow the steps I am going to show you. I had so much fun painting my watercolor gnome a few months ago. 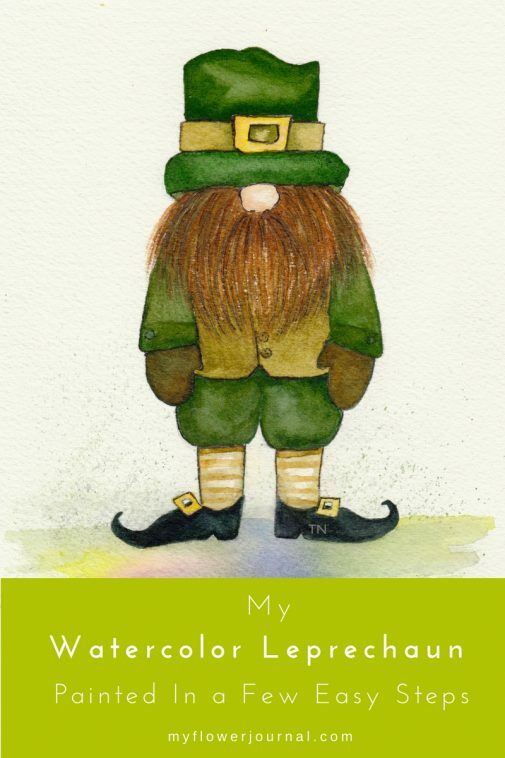 I decided with a few simple changes I could paint a leprechaun in the same way. 1. The first photo shows the simple body shape I like to start with. This is similar to the gnome tutorial I shared a few months ago. 2. 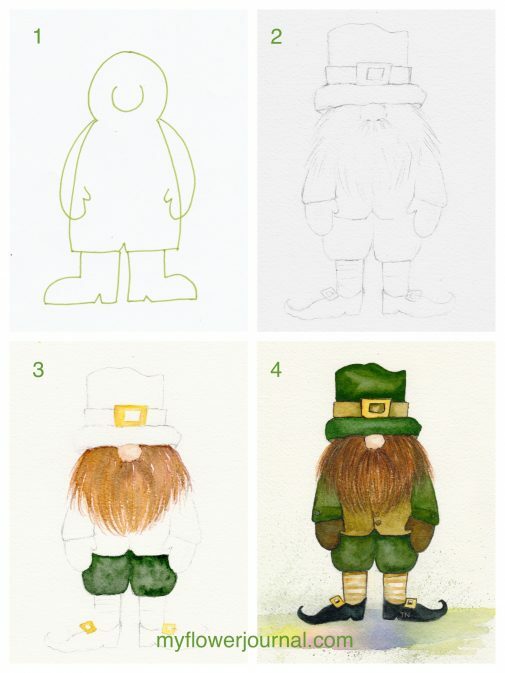 Use a light pencil to sketch your leprechaun on watercolor paper starting with the simple body shape. Add a hat, beard, clothing and shoe details. 3. When you are happy with your sketch get ready to paint. Paint one area like the beard then while it is drying paint another area like his pants. Let an area dry before you paint next to it. If an area has wet paint and you touch it with wet paint the colors will blend together. After an area dries you may want to go back and add another layer of color giving it some shadow and more depth or detail. Remember with watercolors you work from light to dark building layers of color. 4. When you are happy with how you painted your watercolor leprechaun let it dry completely. Then with an extra fine tip black marker add some details to his beard and outline areas you want to emphasize. Next I did a wash of clear water under his feet then dropped in yellow, red and blue letting the colors run together to make it look like a rainbow puddle under his feet. Last of all I added a few paint splatters just because I like paint splatters. Isn’t he cute! There are so many ways you can start with the simple body shape and add details to make fun characters to use for holidays or greeting cards. 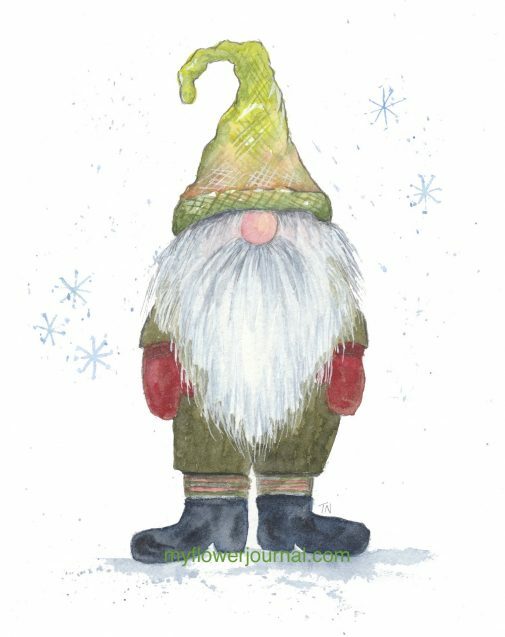 You will find my Watercolor Gnome tutorial here. This post contains affiliate links for the products I use and like. This was so fun Tammy! Thank you so much!! My little leprechaun makes me laugh!! All of your tuts are so fun and easy. You are such an inspiration to me to keep on trying!! He is so cute! You make it sound so easy. I am going to try to paint something similar. I love your watercolor paintings! You are so sweet to share how you create.